The German population during the 1930s and 40s was approximately 1/3 Catholic and 2/3s Protestant. 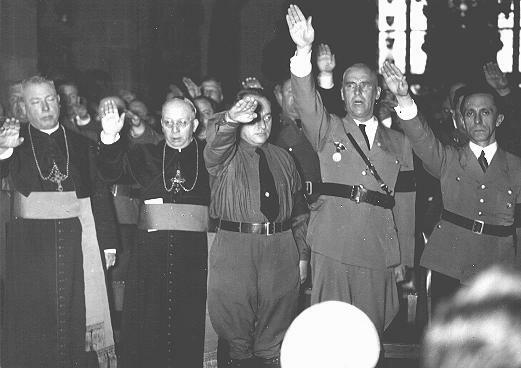 With a thousand-year history of anti-Semitism reinforced by the virulent anti-Jewish teachings of Martin Luther and the collusion of the Catholic Church, the Nazis targeted all those traditionally labeled Other by dominant Christianity. However there were several predominantly Christian countries that resisted the Nazis and actively participated in supporting, hiding and aiding the escape of Jews at risk of being deported to concentration camps. Sweden maintained a neutral stance during WWII. On one hand, Sweden allowed passage for German soldiers to travel through the country. On the other hand, Sweden shared military intelligence to help train soldiers from Denmark and Norway to liberate their countries. Sweden was also a refuge for many Jews seeking safety after the notice of deportation to concentration camps in 1943. Denmark was occupied by Nazis for most of WWII but the Nazis allowed the democratic government to stay more or less in power until 1943. At the time that they lost their government’s power, many Danish people became involved in a variety of underground organizing including producing publications on spying and sabotage. There was also a move to evacuate Danish Jews from Denmark before the Nazis could force them into concentration camps. Holland was occupied in 1940 by Nazis despite claiming a neutral stance early on. Resistance in the Netherlands was often in the form of working slowly or poorly, counter-intelligence, domestic sabotage, and communications. Many people in the resistance in Holland also protected Jews from deportation. Bulgaria originally was an ally of Nazi Germany but managed to protect its Jewish population from deportation. The Germans invaded the country in 1944 in order to deport and kill Jews. This sparked armed national resistance. Hungarian forces were deployed to stop or delay the German takeover of Budapest enabling tens of thousands of Jews to escape the country.